La Chatte Rouge Video Slot Review - Casino Answers! La Chatte Rouge is a 5-reel, 25-line video slot developed by Playtech, featuring a wild symbol, scatter wins, multyipliers, a free spins feature, a gamble feature and a bonus game. You can play the La Chatte Rouge video slot at Bovada. Coin values on the La Chatte Rouge slot machine are $0.01, $0.05, $0.10, $0.25, $0.50, $1, $2 and $5. You can select up to 25 paylines and bet 1-10 coins per line. You can bet anywhere from the minimum total bet of a penny per spin up to the maximum total bet of $1250 per spin. La Chatte Rouge has an incredible betting range that would be suitable for any online slots player. You can manually stop the reels at any time by using the skill stop feature. To play La Chatte Rouge, select your bet and press “Spin” or you can play all of the paylines at 10 coins per line by pressing the “Bet Max” button. The Mask symbol is the highest paying symbol on the La Chatte Rouge online slot game. If you hit 5 of a Kind on a selected payline, you will win the 10,000 coin top jackpot. The Mask symbol is wild and will substitute for all symbols except for the scatter and bonus symbols. The second highest paying symbol is the Champagne symbol, which can pay out up to 2000 coins. The scatter symbol is the Dancer symbol. You can receive a scatter payout by hitting two or more of these symbols anywhere on the reels. 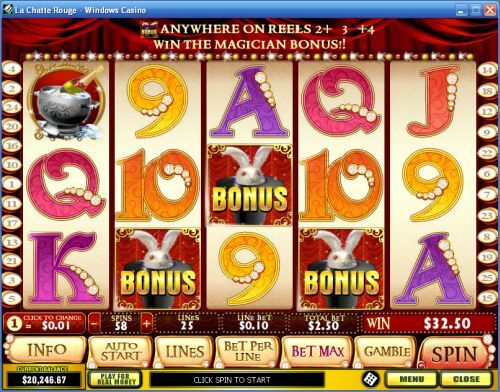 You can win up to 500X your total bet when 5 appear anywhere on the reels. When 3 or more of these symbols appear on the reels, you will be able to choose one of the five Dancers to win up to 23 free spins. During the free spins feature, the Mask wild symbol will act as a 3X multiplier when substituting in winning combinations. The wild multiplier symbol will appear more frequently during the free spins feature. Additional free spins are more frequent during the free spins feature. You can win free cash simply by triggering this feature when you play at Bovada! Press the “Gamble” button after any win to activate the gamble feature. Your goal is to correctly guess whether the next card will be red or black. Correct guesses will double your winnings. You can play up to the gamble limit, which is listed in the “Info” section of the video slot. Press the “Collect” button to save your winnings and exit the gamble feature. La Chatte Rouge has a basic autoplay mode. You can use the “+” and “-” buttons to select up to 99 autoplay spins. Press the “Auto Start” button to begin the autoplay mode. You can stop the La Chatte Rouge autoplay mode by hitting the “Stop” button that is below the autoplay counter (not the pink “Stop” button). La Chatte Rouge is a very good and we dare say underrated video slot. It’s got a bonus game, gamble feature and a free spins feature where you can win up to 23 free spins (which we did). You can play the La Chatte Rouge video slot when you sign up today at Bovada! Can USA players play La Chatte Rouge for real money? 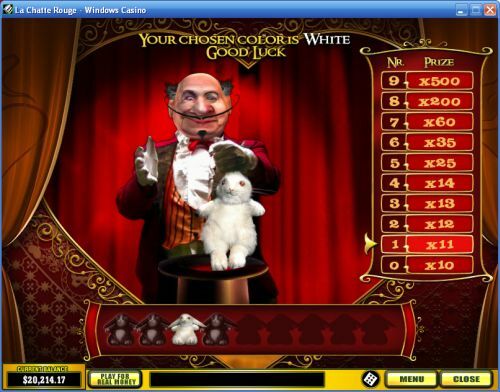 American players cannot play the La Chatte Rouge online slot game for real money at this time. Instead, play some USA-friendly slot machines over at Bovada Casino.